Last summer at the New York Empire State Tattoo Expo (@nyempirestatetattooexpo), I met Herke (@tsurujo_irezuki), who had a couple of really interesting tattoos to share. Herke is a tattooer from Brig, Switzerland, and he owns the The Flying Dutchman Tattoo & Piercing Shop in nearby Naters, Switzerland. He explained that his last name, Kranenborg, translates in Japanese to "Crane Castle." He is a traditional Japanese artists and he also has a kamon, which is a Japanese family crest, that includes a crane in the design. 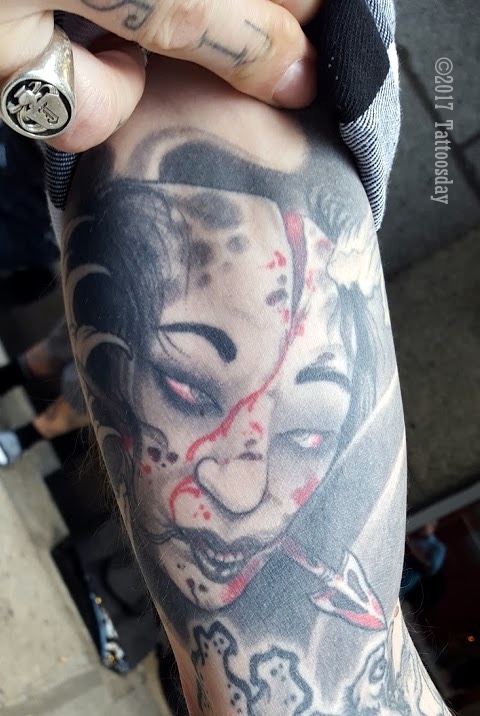 This piece was done in Japan by his tattoo master, Jess Yen (@jessyentattoo), who works out of the Los Angeles area at My Tattoo (@mytattooandpiercing), a shop he founded. Herke counts himself as one of Jess Yen's disciples. Herke explained that he received this to commemorate his 40th birthday. The artist is Jack Mosher (@jackmosher_horimuja) who works out of Hold Fast Tattoo in Prescott, Arizona. Herke explained that in old Japan, after a battle was fought, the women from the victorious village would go to the battlefield, collect the chopped off heads of the slain enemies, clean them up and placed them around the village to commemorate the victories and warn people "if you mess with us, this is what happens to you." In a sense, it is a good luck symbol. 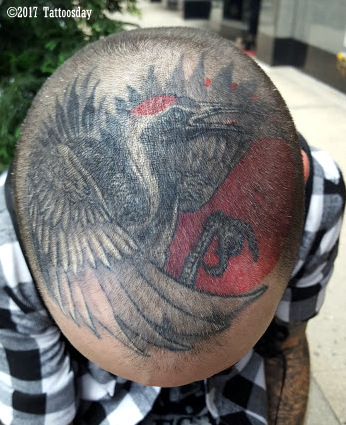 It was actually the first tattoo that Herke showed me before I noticed the crane on his head. 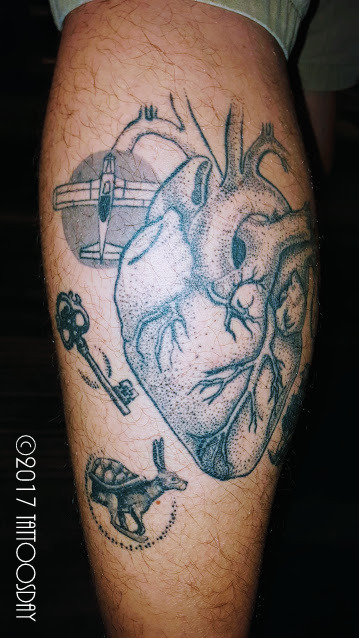 Thanks to Herke for sharing his fantastic tattoos with us here on Tattoosday! Last summer I met a gentleman named Brandon Latham at the New York Empire State Tattoo Expo (@nyempirestatetattooexpo). He had just been tattooed by J.J. Ohlinger (@jjohlinger), who was working the show. "I wanted to draw a tattoo, so I drew an octopus and shaded it and got the look that I wanted and then I gave it to a professional [Ohlinger] to make it into a stencil, to make it a cohesive piece, we kind of collaborated on it ... the octopus is a creature that adapts to its surroundings it has three hearts, and so I kinda did that to represent my wife, my daughter and myself ... it's a creative unique character .... as soon as I thought about doing it, I saw them everywhere ... I thought about it for a long time because I'm not a very impulsive person, it took me a long time to even get a tattoo." Ohlinger did a fine job placing the tattoo and making sure it flowed with the contour of Brandon's body. It's a great piece with solid linework and excellent detail. Brandon explained that "the different figures on the side[s] represent different things about [his] life." For example, the cat wearing the hat is "a Russian symbol that means even if you are born in mediocrity, you san still strive above and be an aristocrat," or, in other words, "just because you're born poor doesn't mean you have to continue to be poor, you can strive above that." He also described the crow reading the book as a steampunk image, noting that "the crow, which is the only animal that analyzes human behavior ... has decided to take care of the children" after the kids' parents have gone off to work. Brandon is a runner (10 half marathons and a couple of marathons), which explains the cool image of the hare with a tortoise shell on its back. And the airplane, he explained "is a piper cub airplane, the plane that my dad used to work on, and my daughter's name is Piper." 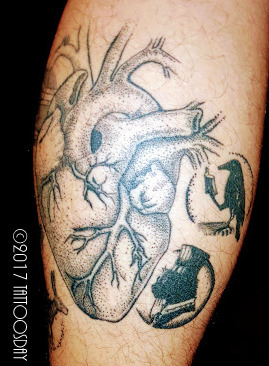 The details in and around the heart really make this a cool combination of tattoos. 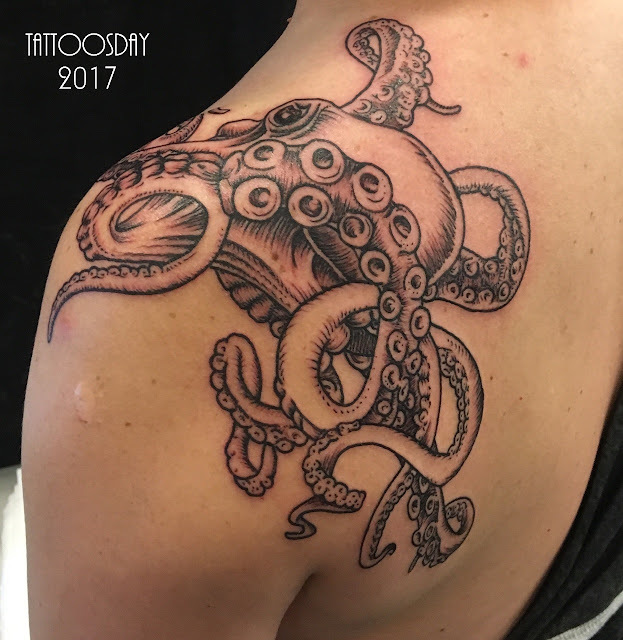 Thanks to Brandon for sharing his work with us here on Tattoosday!